The Building Beyond Buildings exhibition by Bing Thom Architects pays tribute to the firm’s legendary founder, Bing Thom Architect AIBC, who passed away unexpectedly from a brain aneurysm in 2016. The firm is now led by principals Venelin Kokalov and Michael Heeney. The exhibit title ‘Building Beyond Buildings’ is an expression Bing used to describe architecture’s potential to transcend simple bricks and mortar and to shine a light out to the community, enriching the lives of those it touches. The exhibit leads visitors through Bing Thom Architects’ design process. Woven through the exhibition are the two lines of exploration – cultural sustainability and material assembly – that ultimately inform Bing Thom Architects’ work. 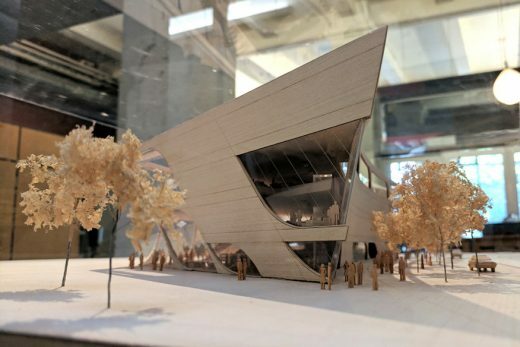 The AIBC exhibition features models, drawings, and photographs of a selection of the Royal Architectural Institute of Canada Gold Medalist’s work accompanied by recent projects by the architecture studio. BTA + RLP Company Ltd. (a Joint Venture Partnership between Bing Thom Architects, Vancouver and Ronald Lu and Partners, HK) is delighted to be invited to participate in the architectural competition for the design of the West Kowloon Cultural District’s Xiqu Centre. A centre of artistic and cultural dialogue, this ground-breaking performing arts centre will be the first signature venue in the WKCD and will set the standard for what will become the largest cultural precinct in the world. The Xiqu Centre will be a platform not only for the preservation and development of Chinese Opera in Hong Kong, but also for the interaction between Xiqu and other performing arts. Chinese Opera has a long and well respected tradition in Hong Kong and is evolving into thriving contemporary art form. The new Xiqu Centre will nurture this evolution, transcending Chinese Opera to ensure its continuity and growth for the future. Blending and respecting a deep history with current culture and theatre technology into a contemporary form, the result will be an innovative and inspired architectural icon that will become an internationally recognized front door for the WKCD. Together with renowned specialty consultants from around the globe, our fluently bilingual (Chinese/Cantonese) team blends Hong Kong roots with extensive skills in performance arts centres and a long-standing history in the research and design of Chinese Opera venues. BTA + RLP look forward to igniting the imagination and creating a cultural landmark that will inspire both the public and artists alike. BTA+RLP is a unique partnership that combines BTA’s design strength and international reputation on high profile performing arts projects with RLP’s deep local knowledge and excellent project design and delivery expertise. RPL’s recent experience implementing the WKCD master plan ensures that the design of the Xiqu Centre will tie into the larger vision for this important cultural precinct. At BTA + RLP, we strive towards a holistic approach to architecture, which we see as a collaborative effort of many individuals and disciplines. In particular, Bing Thom’s charismatic ability to bring focus, inspiration and consensus amongst a wide variety of stakeholders is legendary. BTA and RLP have long had an interest in Chinese Opera and over the past 26 years have been involved in such relevant projects as the building of Ko Shan Theatre Annex, Feasibility Study of Revitalizing Yau Ma Tei Theatre, Research in Bamboo Theatre Cantonese Opera and the design of the Yuxi Opera Theatre. For the Xiqu Centre we have assembled our most passionate and talented staff. This team is respected for both their project design and execution virtuosity. The collective team has worked on landmark projects such as Arena Stage in Washington DC, Epcor Centre for the Performing Arts in Calgary Canada, Chan Centre for the Performing Arts in Vancouver Canada in addition to many others including those mentioned above. To supplement the architectural design team, we have also brought together an exceptionally strong team of local and international experts in engineering and design including Buro Happold/Atkins (total engineering – SMEP and Civil), the SWA Group (landscape) and MVA (traffic). As a fully integrated team, we are looking forward to creating and delivering a vision for the Xiqu Centre that will support the tradition of Chinese Opera and transform the West Kowloon Cultural District through the power of perfoming arts. Bing Thom Architects (BTA) is an internationally recognised Canadian architecture and urban planning firm with a 30-year history in large scale performing arts, cultural and public institutional projects. With major works in Canada, the US, China, BTA is known for design excellence and project leadership. Winner of the 2010 Royal Architecture Institute of Canada Firm of the Year Award, BTA inspires diverse teams of professionals to produce exceptional work. August 9, 2017 in Architects.